Saint Pantaleon was born in Nicomedia of a pagan father and a Christian mother, who died while her son was still a child. He was among the court physicians of the Emperor Galerius Maximianus. Deceived by hearing the false maxims of the world applauded, he was without religion when God decided to rescue his soul from its unhappy darkness. 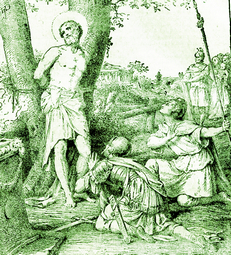 A zealous and prudent Christian named Hermolaus took special notice of him and awakened his conscience, telling him that although the famous physicians of ancient times had possessed the science which cures bodies, Jesus Christ was a far more excellent Physician, able to cure not only bodies, but souls, by His divine doctrine. Hermolaus succeeded in bringing him into the fold of the Church. The young Christian strove to procure for his father the same grace he himself had received, and his words had already begun to separate his father from his idols, when one day a blind man, led by friends, came to the door and begged Pantaleon to cure him. His father was present and heard the promise his son made to this man to do so, if he would give to the poor the money he was offering him. The father was amazed and feared that the promise could not be fulfilled. But the young Saint prayed and touched the eyes of the blind man, invoking the name of Jesus Christ, and his eyes were opened. Pantaleon's father and the blind man were both baptized as a result of this miracle. When Eustorgus, his father, died, Saint Pantaleon liberated all his slaves and, having sold most of his possessions, gave to the liberated ones and others the assistance their poverty required. He cured other illnesses and soon became renowned in Nicomedia. Saint Pantaleon, being a very sincere penitent, ardently wished to expiate his former idolatry by the martyrdom he could foresee. When a bloody persecution broke out at Nicomedia in 303, the blind man he had cured was beheaded upon refusing to admit that it was the gods who had cured him. Saint Pantaleon, to prepare himself for the imminent combat, distributed all he had left among the poor. Not long after this act of charity he was arrested and subjected to various tortures, during which he was preserved from death. Three other Christians, of whom one was Hermolaus, were apprehended. After suffering many torments, the four confessors were all sentenced to be beheaded. The relics of Saint Pantaleon were translated to Constantinople, and there received great honor. His blood, conserved in a small vial, is said to liquefy on his feast day and become oxygenated. Charlemagne brought a part of his relics into France, where they are presently divided again, a portion being in the abbey of Saint Denys near Paris, and the head at Lyons. Saint Pantaleon, whose name means the all-compassionate one, is the patron of physicians. If anyone loves Me, he will keep My word, and My Father will love him, and We will come to him and make Our abode with him.